If arthritis is causing your cutting to suffer, I strongly recommend trying a die-cut machine. It has changed my life! Days when my hands are swollen or hurting is not the time to pick up the rotary cutter. I simply do not have the control to cut accurately. Not to mention, I am afraid of cutting myself. Die-cutting machines help you quickly, easily and perfectly cut out an entire quilt top, even when your hands hurt or you aren’t having a “good grip” day. Sizzix also has a Big Shot Pro, which I also own. It accommodates up to 12 inch wide dies such as the Double Wedding Ring as well as Victoria Findlay Wolfe's Tulip and Melon Dies, seen here. This was a small quilt I made for VFW's blog hop and I loved it! It went together so fast and easy! 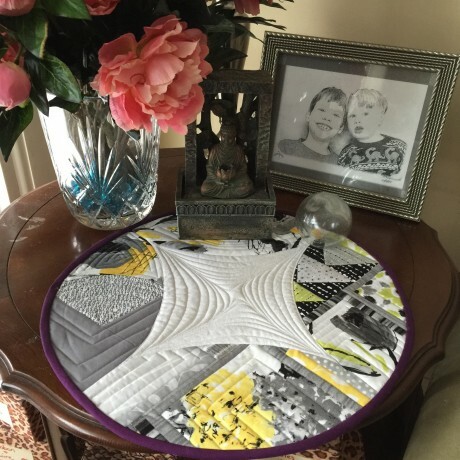 Here is my favorite bonus that you only get with Sizzix: you can use Accuquilt dies(with an adapter) in the Sizzix, but not the other way around. I easily use both Accuquilt Dies and Sizzix dies in my machine. I can also use the new Spellbinder's as well. They all work in my Big Shot Pro! If you are reluctant to pull the trigger on die-cutting because you think that you won't use those specialty dies, think about cutting strips, small pieces and even squaring up blocks. I can cut oodles of strips with a few turns of the handle. 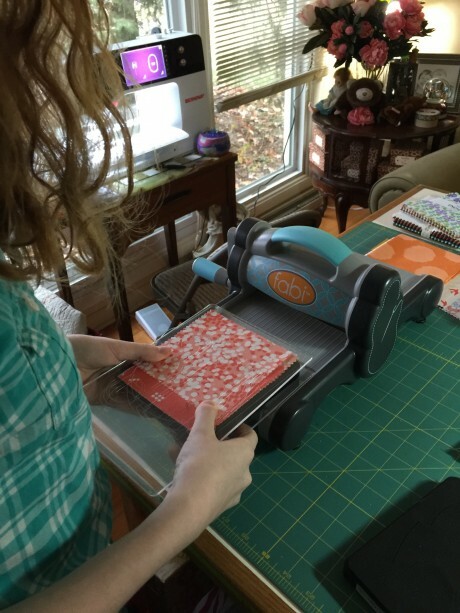 My good friend EbonyLove has a ton of information on her website as well as two books on die-cutting, a new video and plenty of tips on using these versatile machines. Go check out her site for tons of useful information. Please feel free to post your questions in the comment section and I will be happy to answer them. *MSRP: Fabi and Big Shot Pro, www.sizzix.com $119 - $449, machines; $19.99- $69.99, for dies. What Features Should I Look For In A Sewing Machine? First off, I gotta say I was blown away from the response to this blog. I got messages all over social media and it was quite clear that I struck a chord. So many of you are looking for solutions that allow you to sew longer and better. One comment in particular got my attention last week. 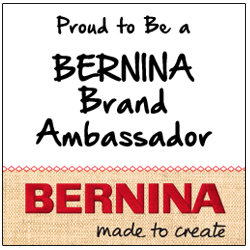 A reader on Instagram mentioned that she bought her 8 Series BERNINA because she had R.A. My mind started racing. OF COURSE, the sewing machine!!! What features should you look for when buying a sewing machine if you have autoimmune disease, arthritis, vision problems or limited mobility? Now, in the interest of full disclosure, I think it is safe to say that I bleed BERNINA red. I love everything about the company and the machines they produce. I am also a brand ambassador which means that they provide me with a sewing machine to use for a year. I think it is pretty safe to say that I will be purchasing my current loaner, the B790, at the end of the year. She is like an extension of my hands. Cleaning your studio takes a really long time! Everything takes longer with Autoimmune disease. This was me as I was cleaning. I am allergic to dust and my dry lungs don't like cleaning! The good news is my room is all dusted and nice now. Wanna see? "Tracy, I think what you are doing is great! This question might be best asked of the quilt teachers and book writers that I imagine have very busy lives.......HOW do you save time? Do you draw up your design first and then "kit it up?" Do you have an assistant? If so, what do you have them do for you in the way of making a quilt? Also, how do they make the best use of their time? You know, those small amounts of time that are broken up by days of not quilting." Quilting has become much more than a hobby for me. I write for Generation Q Magazine and I design projects for kids to sew in the feature We Sew 2. I also teach kids sewing classes. On any given day, I am going between writing, editing and sewing. In other words I keep several balls in the air as I juggle numerous projects each day. Add in an autoimmune disease like Sjogren's Syndrome and it is amazing I get as much done as I do. The struggle is real. Brain fog is real people. It's a lot. I drop balls all the time. Some days I can't write because I am in pain. Other days I can't cut fabric unless I use my Sizzix for fear of ruining fabric. Most days I have just enough brain fog going that I have to retrace my steps on a project to remember where I left off. It's hard. This doesn't even go into my personal projects that sit neglected. Here is fabric that sits waiting for me to turn into a quilt using Victoria Findlay Wolfe's Tulip and Melon dies.